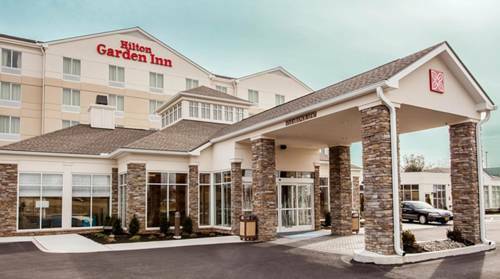 The new Hilton Garden Inn Uniontown hotel is nestled in the Laurel Highlands just 10 minutes from historic downtown Uniontown PA. Enjoy a lush rural setting with quick access to shops restaurants major offices and conveniences. Feeling outdoorsy. Laurel Caverns has 3 miles of natural passageways to explore and Ohiopyle State Park is minutes away for hiking fishing whitewater rafting or a family picnic. Step into history at Fort Necessity National Battlefield built by George Washington during the French and Indian War. Start each day with a freshly made breakfast of American favorites at The Garden Grille or order a meal from the comfort of your guest room. Sip an evening cocktail in the Pavilion Lounge or relax outside by our firepit. The 24-hour Pavilion Pantry has your favorite snacks drinks and travel essentials. Unwind in the heated indoor pool and whirlpool or visit the complimentary 24-hour fitness center. Our Uniontown PA hotel offers flexible event space for 70 guests and a 24-hour Business Center.